For a simple, fruity, fall comfort dessert, nothing beats a good apple crisp! We never tire of this autumn treat at our house, and when we run out of apples… we substitute pears. 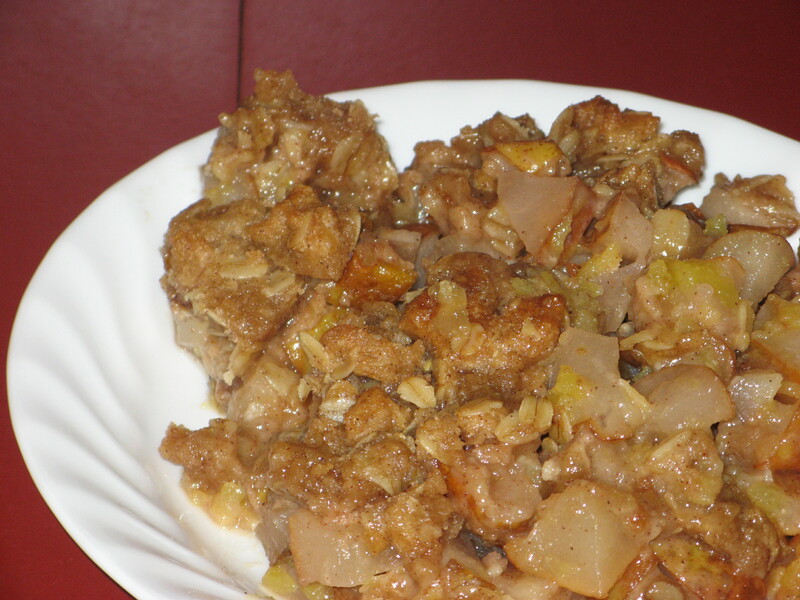 Arrange apples (peeled, sliced, and chopped) in a 9×13 pan about 2 inches deep. Mix the rest of the ingredients. Crumble over the apples. Bake at 375 for about 40 minutes. Ran out of apples... so we used pears. Head on over to Life as Mom for more apple-themed recipes! Lots of shared recipes at The Grocery Cart Challenge, too! Sounds good with pears, too. Thanks for sharing your recipe! This looks DELICIOUS!! I can’t wait to try it out this weekend; I have all necessary ingredients at home already..woohoo for that!! That looks so good, and it sounds so easy. We are finishing up an apple pie right now, but I think I’ll try this one next. I love apple crisp, peach crisp, pear crisp, can you tell how picky I am, haha!